It’s tied in with The Last Jedi. Electronic Arts is keeping its promise of supporting Star Wars Battlefront II with free content after release as it presents the first season of add-ons. It all starts on December 5 when players will be asked to choose their side either the First Order or the Resistance. Then on December 13 Captain Phasma and Finn join their respective sides as hero units, that can be purchased using in-game credits. 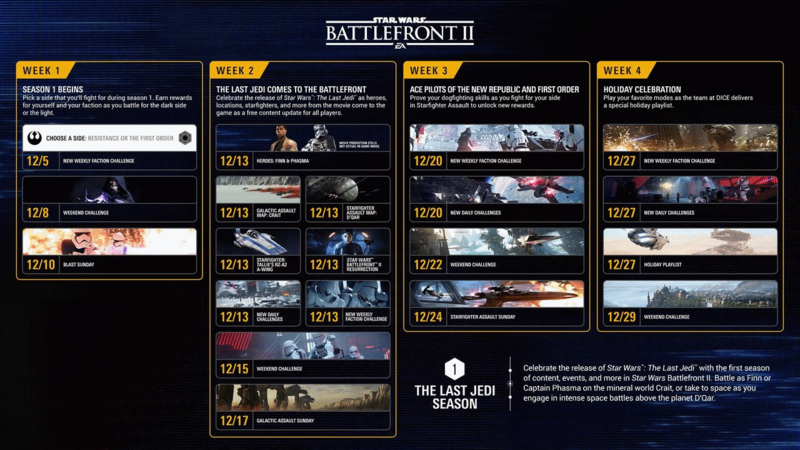 Also on December 13 two maps will arrive – Galactic Assault map Crait and the Starfighter Assault map D’Qar. Tallie Lintra’s RZ-2 A-wing will be the new starship joining the roster. There will also be some single player goodies with new story chapters documenting the main character’s, Iden Verso, early days as the First Order rises to power. Star Wars Battlefront II releases on PlayStation 4, Xbox One and PC November 17.